(Nanowerk News) Today, basic units of computer chips are often thinner than a human hair. However, electric current flow is determined not only by the semiconductor components, but also by their interconnects. Dr. Regina Hoffmann from the KIT Physical Institute studies the structure and electronic properties of these nanocontacts and has now been the first researcher in Karlsruhe to be awarded the renowned ERC Starting Grant of the European Research Council for her project. The ERC Starting Independent Researcher Grant is a module of the seventh research framework programme of the European Commission. It is awarded by the European Research Council ERC, a Europe-wide institution to promote pioneer research, which has been inspired by the German Research Foundation (DFG). The ERC Starting Grant is awarded exclusively to young scientists, who are presently aged 36 on the average. Competition of proposals is tough. For the coming funding period, more than 2500 proposals were submitted to the ERC. About 240 young researchers from 19 European countries were awarded a grant. The KIT scientist Regina Hoffmann is one of them and will be granted a total of EUR 1.5 million for her research covering a period of five years. 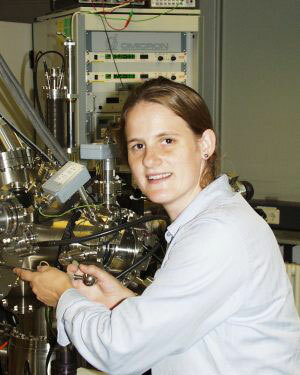 Research into nanocontacts for quicker computer chips: KIT scientist Regina Hoffmann. To increase the speed of computing operations, the size of transistors is presently halved about every 18 months. One aims at increasing computing capacity while decreasing the size of the components. Today, structural widths below 32 nanometers are achieved. “The ultimate limit will be reached when oxide thickness in semiconductor transistors will correspond to a single atomic layer”, underlines Hoffmann. According to her, it is therefore considered to accommodate the function of a transistor in the design of a molecule. But even if traditional semiconductor technology will be pursued further, the transistor interconnects will have to be reduced in size in line with the transistors themselves. In these small metal wires, both quantum mechanical wave properties of the electrons as well as the atomic structure of the contact determine electronic current flow. While electric current in such nanocontacts has been studied previously, methods to identify the detailed atomic structure of the contacts have been lacking so far. In the past, information on the structure of the contacts was only derived indirectly from the electronic properties. “By reducing the distance between an atomically sharp tip and a single atom of the contacts and by measuring the resulting forces using scanning force microscopy, the structure of the contacts can now be studied directly”, says Hoffmann. “In addition, we have succeeded in producing atomic contacts by electric means exclusively. This allows to study air-sensitive contacts in ultra-high vacuum”. Dr. Regina Hoffmann is a physicist and has been working at the Physikalisches Institut of the KIT since 2003. She completed her studies at both University of Karlsruhe and the Ecole Nationale Supérieure de Physique de Grenoble (ENSPG) with a double diploma. Hoffmann was awarded her PhD at the University of Basel, Switzerland. At McGill University, Montreal, Canada, she studied molecules on insulating surfaces by atomic-resolution scanning force microscopy within the framework of a Feodor Lynen fellowship of the Alexander von Humboldt Foundation. At Karlsruhe, she studied atomic gold chains on silicon surfaces. Since 2005, she has been focusing on metallic atomic-size contacts and was supported by the Landesstiftung Baden-Württemberg within its excellence programme for postdoctoral fellows .